Once again we have one winner who picks up the trophy in two categories: Bonnie Tyler, the Welsh singer who represented the United Kingdom in Malmö with the song Believe In Me, written by Desmond Child, Lauren Christy and Christopher Braide, wins the awards for Best Song and Best Female Artist with 12.6% and 16.9% of the vote, respectively. Congratulations, Bonnie Tyler! It’s the first time for a UK representative to pick up an award in the ESC Radio polls. The UK’s best result to date was in 2011, a sixth place in the Best Song voting with I Can, and a third place for Blue in the Best Group category that same year. The second place in this year’s Best Song category, with 7.5% of the vote, goes to Norway’s entry I Feed You My Love, performed by Margaret Berger. The Italian entry L’Essenziale finished in third place with 7.14%, by a hair’s breadth ahead of Ukraine’s Gravity with 7.05%. 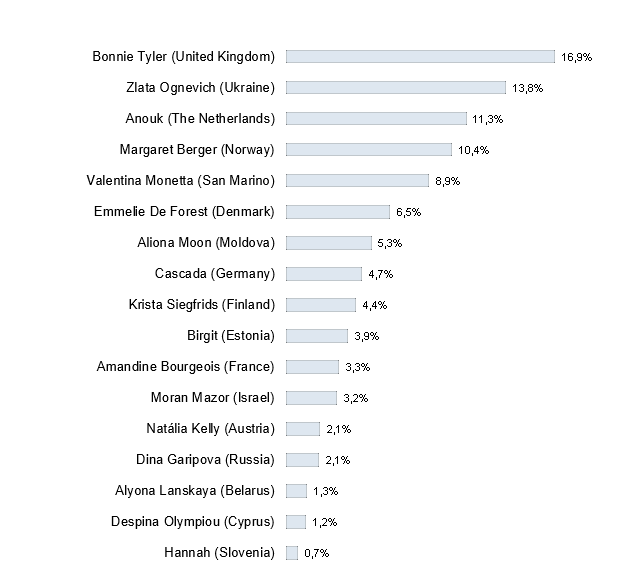 Their representative Zlata Ognevich (13.8%) finished second in the Best Female Artist category, and Anouk from the Netherlands came third (11.3%). Anouk’s Birds ranks fifth in the Best Song voting. 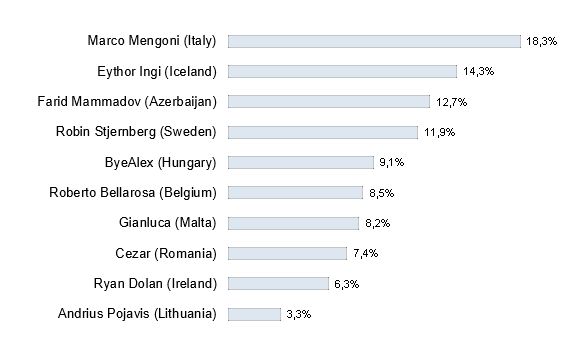 Marco Mengoni who came 7th in the contest in Malmö wins the Best Male Artist voting with 18.3%, clearly ahead of Iceland’s Eythor Ingi with 14.3% and Azerbaijan’s Farid Mammadov with 12.7%. It’s Italy’s first win in the ESC Radio Awards. In the Best Group category Koza Mostra feat. 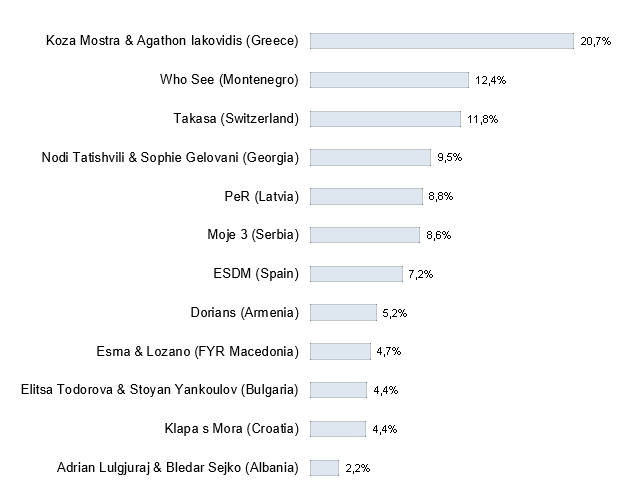 Agathonas Iakovidis came out the clear winners: 20.7% of the vote went to the band who represented Greece in this year’s Contest. This is the second ESC Radio Awards win for Greece, in 2006 Anna Vissi picked up the awards for Best Song and Best Female Artist. Two groups that did very well in the semi-finals’ televoting but found themselves eleminated by the jury vote – Who See from Montenegro and Takasa from Switzerland -, took the second and third place in the Best Group category. Congratulations to all the winners! We will get in touch with them to hand over the trophies as soon as possible. For the complete rankings of the 2013 ESC Radio Awards, see below please. This entry was posted on Monday, June 17th, 2013 at 4:13 pm	and is filed under ESC Radio Awards, News. You can follow any responses to this entry through the RSS 2.0 feed. You can leave a response, or trackback from your own site. I have 2 say I like Bonnie, but this victory is strange en not deserved!! Bonnie is just the winner! She is a live singer! A real Artist! She deserves to win! But as we all know the eurovision is ALL POLITICAL! Thats it! she deserves to win! she is the best of all! I guess, only the brits visit here…………Anyway….I`m so glad that our FARID MAMMADOV IS ONE OF THE BEST MALE SINGER………….. Smells like fanclubs rigged the contest. Bonnie’s Victories are well deserved! And to those who say that the fan clubs rigged the voting….HA! It’s not rigging for being a supportive fan. At least we don’t have to cheat like Russia or Azerbajjan to win! Or any small nation in Europe. This is the REAL Eurovision right here! Congratulations BONNIE TYLER! Very well deserved! She is definitely one of the finest singers in the world. Justice at last! Marco Mengoni is THE winner people! Europe, hear the sound?! Well deserved for Bonnie Tyler! A great song with “Believe In Me” and a great performer. Marco Mengoni is the only one; faboluos voice and handsome. Marco the world is waiting for you! I am so glad that Bonnie Tyler won two directions! Bonnie Tyler the best! My congratulations! ! ! ! ! ! ! ! ! ! ! ! ! ! ! ! ! ! ! ! ! Congratulations Bonnie Tyler for your Awards. You do deserve them. I could not believe that there were no points from Germany for the UK 2013 and also 2012, even though both performers were so popular and beloved in Germany, this is prooved whenever they appear on stage in Germany. Finally!!! The fans have truly voted!!! People like Meghann, and others are the true fans…not all the VOTING POLITICS that happen at the contest year after year. Bonnie Tyler, who in the contest got very few points (because the UK is not part of the predominant POLITICAL BLOCS), did an amazing job and deserved to win. I think it should be fairer to have Internet voting like here at ESC Radio. These are the TRUE and LEGITIMATE FANS voting, not the GOVERNMENTS (or whomever) who cast the votes at the real contest. I’m in favor of INTERNET VOTING. LONG LIVE THE TRUE FANS!!! DOWN WITH THE POLITICIANS AND THE MAFIAS!!! I have to agree with some here, that the results are baffling. I wish there were a way to register why certain artists were chosen, but I think psychographics is the last thing needed to complicate this more. In the case of Bonnie Tyler, I don’t doubt that she won fair and square, but I simply can’t understand how Dina Garipova from Russian ranked so low. Her voice was beautiful, her English flawless and the words were so meaningful. Well its obvious that older fans that lived their younger years with Bonnie’s songs at discos couldnt vote fair….! I liked Bonnie and her studio version song was ok but live she couldnt sing…SHE didnt sing thats the truth she just used eurovision to promote her album now that nearly all have forgotten her. When there were so many female singers with amazing voices(heard the Russian singer wiothout backups e.t.c and she was amazing and i felt so sad for Bonnie cause there u could see how bad she was….!). Learn to be fair and if u cant be fair then dont talk about political voting and other craps.Pls Uk dont use again big names that have no carreer anymore its so sad for people who liked them once.UK could win the contest anytime if they wanted now they are just joking! Thank you very much to all fans that gave Bonnie this amazing honour. I think she gave us so much fun and fantastic moments with her extraordinary voice so this is just a small sign for her work. She is such an amazing person. Looking forward to any new album, hope it will be something great like ‘Rocks and Honey’. Are everybody drunken? Or missed the boys her mother in malmö??? In my opinion Zlata was the best female artist so far.